Animated Step-by-Steps®: Using 'Core 48' Displays with ASbySs! Using 'Core 48' Displays with ASbySs! 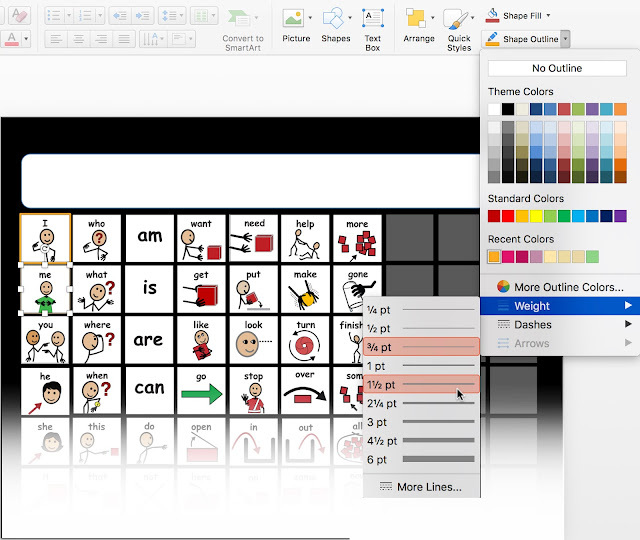 I’ve recently created some communication displays using PowerPoint (designed for use on an Interactive Whiteboard) that I hope will provide you with an easy way to infuse more Aided Language Stimulation into your Animated Step-by-Step Activities. These ‘Core 48’ Displays are built in part on DLM's ™ ‘First 40’ words. The DLM’s 'First 40' words represent 40 words frequently used in both spoken and written communication … so obviously that’s a powerful place to start your communication programming. These high frequency words are being used as ‘core’ vocabulary. An additional 8 words (have, eat, drink, play, gone, feel, out, good) have been added to 'round out' the display. Thank you Deanna Wagner for starting me on this list of extras. The displays also include 16 grey cells reserved for ‘fringe’ vocabulary (i.e., vocabulary specific to the activity). Although the terminology, Core + Fringe has been in existance for a long time, it is only recently that there has been a seismic shift toward using core words when conducting communication training in ‘mixed ability’ classrooms. 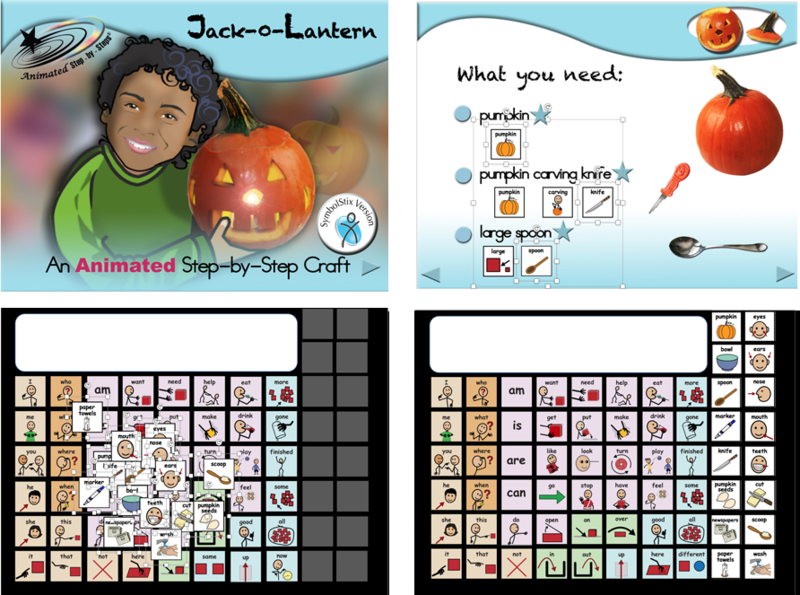 As mentioned in a previous post, teachers in the early grades use their Animated Step-by-Steps® (ASbySs) to pace their students through the steps of a project, using either the text or the symbols to guide the lesson. Teachers in Grade 2 and beyond, however, often opt to conduct their projects (recipes, crafts, science projects) across two consecutive days allowing teachers to focus in depth on literacy the first day and communication programming on the second day . On Day 1, they use the ASbyS to preview the steps as a literacy activity, simultaneously introducing the materials and exposing students to the event sequence and the symbols that will be needed to mediate the actual activity that occurs the next day. On Day 2, students are invited to direct the teacher or speech-language pathologist in the conduct of the activity. Communication strategies assume ‘center stage’ on Day 2. 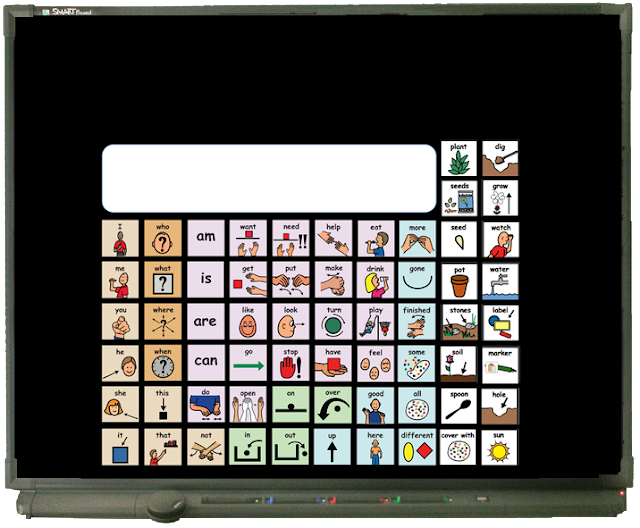 A communication display replaces the ASbyS resource on the IWB and Aided Language Stimulation becomes the primary strategy for ‘setting the stage’ for interactive communication. The ‘Core 48’ Displays are designed to address this role using a Core + Fringe Vocabulary format. The 'Core 48' display can be rendered in keeping with several different color coding schemes. Choose the scheme that will work best for your students and your agency. Each symbol on the display is programmed with sound. Touch the symbol and its label will be heard in a 'child voice'. 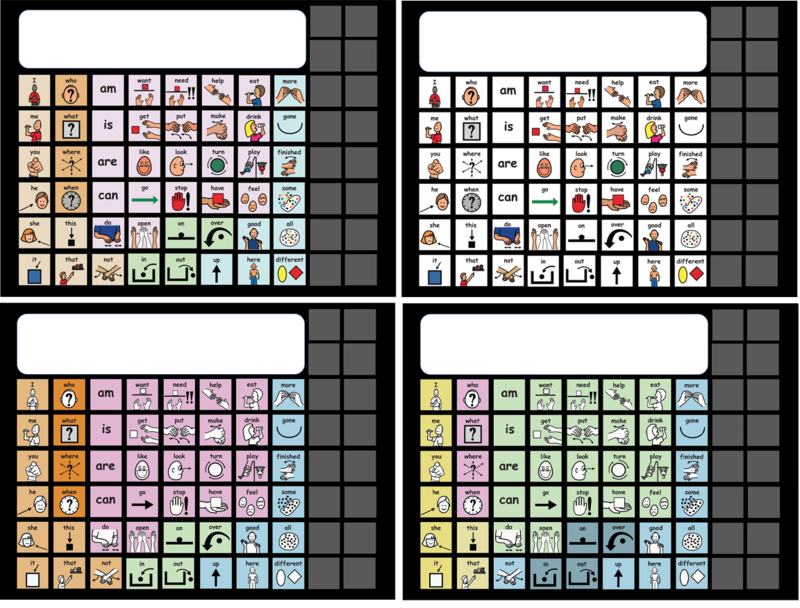 On the far right there are several grey boxes where the symbols for fringe vocabulary can be added to the display. Can I Limit the Number of Symbols on the Core Display? If you feel there are too many symbols in the ‘Core display’, you can selectively alter the transparency of some symbols making them invisible or less prominent in the symbol array. This is a strategy that has been in existence since the early books on Engineering the Classroom for Interactive Symbolic Communication... plan the display long range, then cover key symbols that you will be exposing gradually over time. Proloquo2Go uses a similar strategy allowing you to make symbols partially visible or totally invisible. If, for example, you’ve decided that your class is not quite ready for those frequently-used auxiliary verbs ‘is’, ‘am’, ‘are’, ‘can’, or the pronouns ‘he’ ‘she’ ‘it’, simply minimize their presence in the core display. You are not eliminating these symbols; you are just making them invisible or partially visible in the array. Their assigned location in the symbol array remains intact. Although this strategy does allow you to introduce symbols gradually over time, I’ve always found children to be more accommodating of a larger array than you might think. Although lessons might be a bit ‘shaky’ in the beginning, students do seem to settle into a larger array with repeated exposure. Illustrated below are symbols that have been 'dimmed' and information regarding the process for altering the transparency of select symbols. At the top of the display is a pseudo ‘message window’ It primarily provides a space for writing using the IWB pen tools. For example, you might choose to label the display in handwritten text or write the text for needed words as the project unfolds. Can I Easily Add Fringe Vocabulary? The easiest and fastest way to add 'fringe vocabulary' is to ‘harvest’ symbols from the corresponding ASbyS for the target activity. 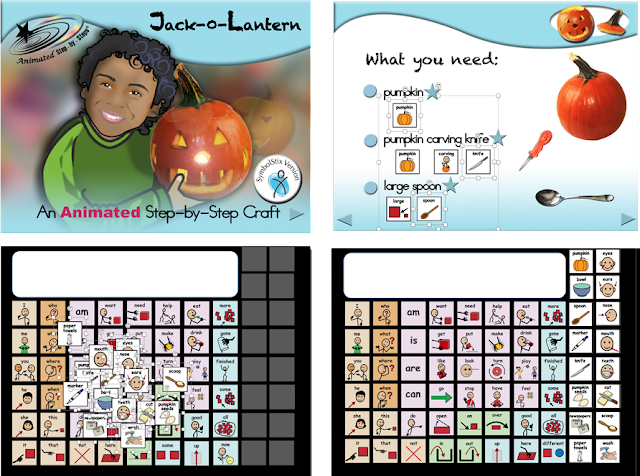 For example, if you are going to be carving a pumpkin for Halloween (Jack-O-Lantern), you will need project-specific vocabulary e.g., PUMPKIN, KNIFE, SPOON, CUT, EYES, MOUTH etc. Open up your PowerPoint application. Under File, select Open and navigate to where the PowerPoint Show version of Jack-o-Lantern resides. The resource opens in editing mode. You can now select the grouped symbol block on the page, then further sub select appropriate individual symbols within that block using the shift key (to select more than one). Copy and paste these selected symbols on to your Core display. 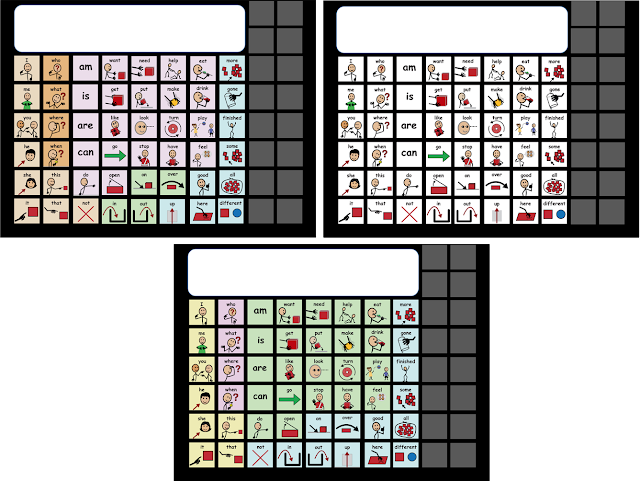 Don’t worry about placement, just copy and paste all the ‘fringe symbols’ that you think would be helpful for conducting ‘language-rich’ Aided Language Stimulation. Repeat this process, page by page. Don't worry if you've imported more symbols than there are available slots... you can 'prune' the list later. Next, drag these recently pasted symbols, one by one over to the fringe zone on the right and place them centered on the place holder squares. Try to be logical about how and where you’re placing the symbols. 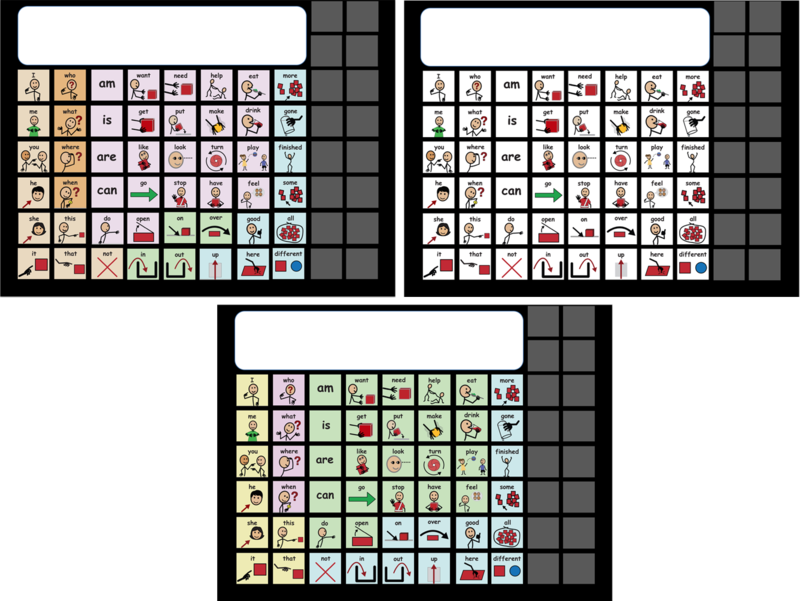 For example, all the body part symbols (eyes, nose, mouth, teeth) might be in one column, the equipment might be in another area, while another column might be used for project-specific verbs (cut, scoop) and adjectives (yuck). If the symbols import smaller or larger than the squares, you can select them and re size them as a group until they 'fill' the grey squares. Time permitting, you can assign voice-output to these fringe words. Although this extra effort is not mandatory you will need to assign a click or 'silence' to these imports to prevent the program from moving to the next page. If you wish to use a child’s voice, record the labels in Audacity (free program) and use this program to alter the pitch of your voice to create a ‘child’s voice’. The younger the children … the higher the pitch. The reader is referred to a previous post that outlines the steps for accomplishing this goal. http://bit.ly/ASbySs_ChildVoice Keep these recordings in a folder on your laptop. It's amazing how much time you will save over time when you save sound bytes as you go. The beauty of this system is the fact that it is relatively easy and it provides a relatively consistent and quick way to infuse symbol support into your lessons. Below you will find the same 'core 48' display setup for a food preparation activity and a science project. 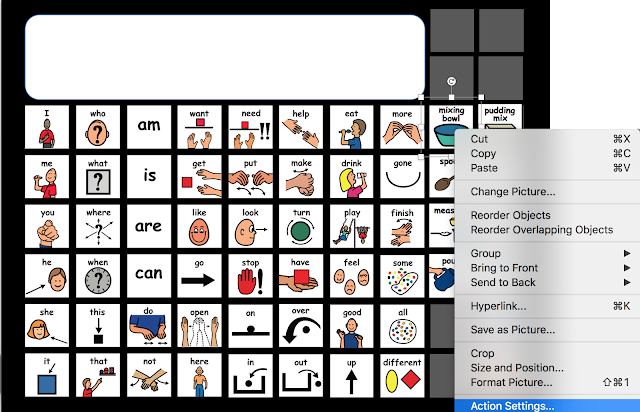 The entire process of adding fringe vocabulary to the core vocabulary took 5 to 10 minutes … certainly a reasonable time frame for busy classroom staff. An alternate scenario reverses the setup. 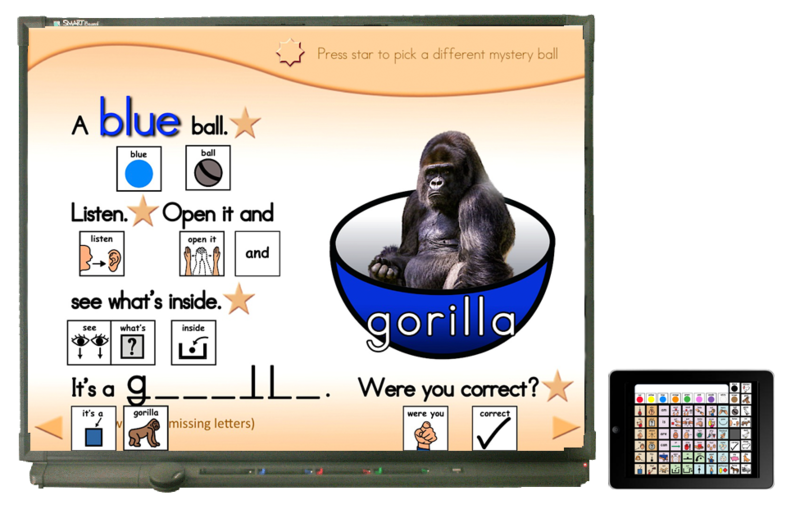 Imagine the resource Mystery Animals displayed on the classroom’s IWB. The Core 48 Communication Display with the fringe vocabulary for Mystery Animals is displayed on a child’s iPad using the Microsoft PowerPoint app. I do take extra steps to add voice-output to the fringe vocabulary if I am using it on the iPad. This provides the child with additional visual support to ‘scaffold’ their emerging language during this fun activity. Again we are not talking about students that have more complex AAC needs, but rather students who reflect the ‘augmentative’ as opposed to ‘alternative’ sector of the AAC population. I can model more grammatically correct speech in conjunction with my Aided Language Stimulation, e.g., “I’m NOT sure WHAT we NEED to DO next. I think I’m GOing to NEED a HELPer. Can I Re-Size the Display? Since the display is grouped, you can also re-size the entire display. Why would you want to do that? 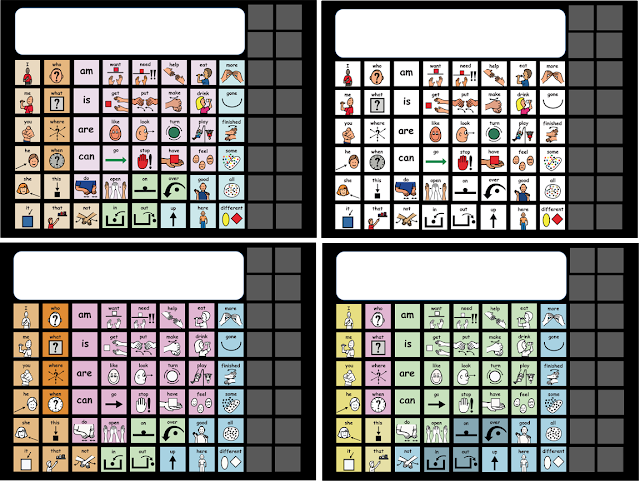 If you are encouraging students to come up to the IWB to communicate, symbols in the upper rows may not be easily accessible for younger students. Consider reducing the overall size of the display and shifting it toward the bottom of the slide so it will display closer to the bottom of your interactive whiteboard. Since the overall display is grouped it is relatively easy to re-size the grouped display. Just be sure to hold down the shift key as you make the grouped display smaller. The sound action settings will remain intact despite the size adjustment. Can I Color Code the Generic Display? The resource offers a more generic version of the display to allow you to incorporate your own color coding system. Feel free to use PowerPoint tools to add a color-coded border if you so desire. I do prefer color coding as I feel it helps to guide my choices on the display. Yes certain words may fall into more than one grammatical category but I’m really just wanting to break the display down into smaller areas for conducting efficient Aided Language Stimulation. The illustration below provides information on adding colored borders. Can I Change Core Symbols? I’ve tried to select core symbols that are generic to allow broader use. For example, there are a lot of alternatives for MAKE (cooking vs. crafting vs. building), OPEN (jar vs. box vs. mouth vs. folder), STOP, HELP and I've offered some alternatives (preloaded with sound) that you can just 'cut and paste' into your display of choice. If you desire a different symbol than the alternatives offered, you can easily substitute symbols that you make using the change picture command. You will be selecting the grouped display then sub-selecting the target symbol within that group. Right click on that symbol and select change picture then navigate to where you have saved an alternate version of the symbol you wish to replace. Having worked a lot in classrooms, I’m excited about this new ‘easy to implement’ format. It allows you to move forward on an agenda to target 48 frequently occurring words while providing an easy system for infusing fringe words into this Core + Fringe framework. All the ‘heavy lifting’ for delineating potential fringe vocabulary has been provided by the Animated Step-by-Step resources. This ease of setup makes this an approach worth considering for your classroom. Try it and let me know how it works for you!